Tag Archive | "Austin Anderson"
Austin Anderson (center) and friends Jacob Swinehart (left) and Andrew Watts (right) recently completed projects at Bellowood Dog Rescue to help Austin earn his Eagle Scout rank. The fence behind them and Welcome sign were two of the projects. Photo by J. Reed. Austin Anderson loves his rescue dog. So when it came time to pick out a project to help him earn his Eagle Scout rank—the highest rank in Boy Scouts—he was inspired to give back and do something to help a local dog rescue. With some help from his mom, he chose Bellowood Dog Rescue in Cedar Springs. 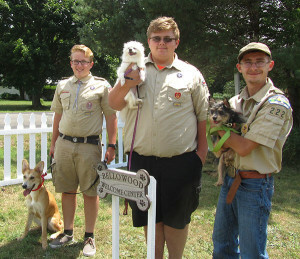 Because of his generosity and help from his friends, family and local businesses, the Bellowood welcome center has a freshly painted fence, new welcome sign, and 20 specially crafted dog bowls. “I am so thankful,” said Kim Schreuder, the founder of Bellowood. “The boys did a great job.” She explained that the Welcome Center is a place where people come to meet the dogs they want to adopt, so it’s important that it look nice. Austin, the son of Dean and Kristine Anderson, will be a senior next year at Cedar Springs High School. He and his friends, sophomore Jacob Swinehart and junior Andrew Watts, paid a visit to Bellowood, and Schreuder showed them around and explained what projects needed to be done. They then chose what they wanted to do. The boys also designed and made dog bowls to help dogs with megaesophagus. 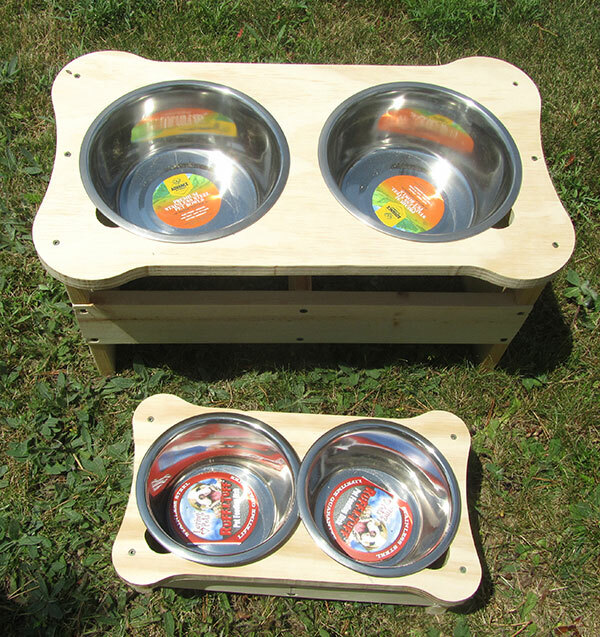 The dog bowls were made to especially help dogs with megaesophagus—a condition that is an enlargement of the esophagus, a muscular tube connecting the throat to the stomach. Dogs with that condition have a harder time moving food and liquid down to the stomach. According to Pet MD, some breeds, such as wire-haired terriers and miniature schnauzers can be born with it. Other breeds prone to the condition include German shepherds, dachshunds, great Danes, Irish setter, Labrador retriever, pug, and Chinese shar-pei. With the new bowls, they are up high enough that the dogs will be able to swallow their water and food much easier. The boys created their own dog bone design from scratch, and made 10 large bowls and 10 small ones. “They are much better quality than the plastic ones you can buy in the store,” remarked Schreuder. The scouts, with some help from parents, also cleaned, scraped, sanded, and painted the front fence, and created a new welcome sign. The materials were either bought at cost, donated, or paid for with gift cards from local businesses. Austin said he now needs to turn in his paperwork as the next step toward getting his Eagle Scout rank. His friend Jacob Swinehart previously achieved his Eagle Scout rank with work on the Kent Theatre. On their last day there, the boys got to play with some of the rescue dogs up for adoption. (See photo). For anyone interested in adopting one of these or another rescue dog, contact Kim Schreuder at xbellowoodx@yahoo.com, or visit their page on www.petfinder.com.